Overview - This haunting, kabuki-inflected version of a Japanese folk legend is set in a remote mountain village, where food is scarce and tradition dictates that citizens who have reached their seventieth year must be carried to the summit of Mount Narayama and left there to die. The sacrificial elder at the center of the tale is Orin (Kinuyo Tanaka), a dignified and dutiful woman who spends her dwindling days securing the happiness of her loyal widowed son with a respectable new wife. Filmed almost entirely on cunningly designed studio sets, in brilliant color and widescreen, The Ballad of Narayama is a stylish and vividly formal work from Japan’s cinematic golden age, directed by the dynamic Keisuke Kinoshita. Though both mediums are frequently used to tell stories, the art of filmmaking and stage performance are entirely different beasts, each holding their own strengths and weaknesses. Infused with the stylistic flourishes of kabuki theater, Keisuke Kinoshita's 'The Ballad of Narayama' attempts to find a formalistic balance between these two very separate but irrevocably related worlds (not unlike Joe Wright's recent take on 'Anna Karenina'). Through a somber reflection on mankind's impermanence, and the pitfalls of unyielding tradition, the director creates a sorrowful allegory that marries the stage to the silver screen. While this union isn't always without conflict, the results are mostly harmonious, engendering an emotionally draining tragedy that lingers with melancholy insight. Inspired by Japanese folk legend, the story focuses on a secluded mountain town where food and resources are limited. To help combat this problem, a longstanding tradition is enforced that requires elderly villagers to be carried to the top of Mount Narayama where they are abandoned to die. With her seventieth birthday approaching, the gentle and noble Orin (Kinuyo Tanaka) prepares for her fateful trip to the summit. Before she departs, her only concern is to find a new wife for her widowed son, Tatsuhei (Teiji Takahashi). Torn between his own love for his mother, and his obligations to the village's rigid customs, Tatsuhei struggles to come to terms with his expected duties -- continually dreading the day when he must take Orin to the ominous peak. Imbued with a strong sense of responsibility and selfless honor, Orin does not fear her journey, nor does she try to escape it. Instead, the proud, loyal woman embraces her people's traditions, and sees the pilgrimage to Narayama as a necessary custom that should not only be followed, but also celebrated. This blind faith in her tragic destiny clashes with her son's clear hesitation, and their relationship creates a palpable struggle between family and tradition. Kinuyo Tanaka's performance is simply devastating, and watching the sometimes disturbing lengths she goes to in order to appeal toward her culture's customs can be absolutely gut-wrenching to witness. Teiji Takahashi is also affecting as her conflicted son, creating a sharp contrast to the village's other more uncaring citizens (including Orin's grandson who might be one of the most despicable characters I've seen in quite some time.) Together, they form a sweet pairing that brings some life-affirming heart to the narrative's otherwise distressingly somber content. Told in a kabuki influenced style, the film features a unique storytelling method that relies heavily on musical narration and ornate studio sets. To this end, a singing voice will occasionally chime in to literally describe the events on screen, elaborating on the plot and characters through a wailing rhythm. Though I eventually grew to appreciate this approach, I must confess that I initially found the tactic to be quite annoying and unnecessary. The chanting musical style itself is a bit grating, and the sung observations are redundant, adding little to the proceedings. Thankfully, the narrating music is used sparingly as the runtime goes on, and does eventually prove to be rather potent in isolated instances. More consistently engaging, however, is the film's overtly theatrical aesthetic. Serving as a kind of hybrid between a traditional motion picture and a filmed stage production, the movie plays up the elements of kabuki theater to its advantage, bolstering the story's parable qualities through openly artificial flourishes. For instance, parts of the beautifully designed studio sets will literally shift apart on-screen, transitioning to new locations within the same shot. Likewise, dramatic lighting schemes and spotlights are used to enhance the emotion of certain sequences, bathing the picture in ethereal hues that mark a clear break from reality. Furthering this stage show aesthetic, much of the movie is actually filmed in wide shots that mostly mirror a live audience's perspective. With that said, Kinoshita certainly doesn't neglect the camera, and the director still uses frequent pans, and occasional push-ins and close-ups to add cinematic emphasis when called for. One sequence staged in a single stationary shot is among the film's most unassumingly powerful. As their departure date nears, the village elders visit Orin and her son, where they then proceed to detail the rules of their trip. The scene is all captured in a solitary, mournful image cast in an otherworldly green shade. While the runtime isn't always as compelling as one might hope, there are many individual sequences like this that manage to offer poignant bursts of emotion and moody style. Similarly, the film's last twenty minutes are also worthy of special note. With Orin strapped to his back, Tatsuhei somberly trudges up the mountain, his body hunched over and his heart heavy -- and once they finally reach the summit, we are treated to a truly haunting sight. Though its grizzly impact is slightly tempered by the film's overtly artificial aesthetic, the style goes on to give the image a gravely mythic quality that carries a darkly lyrical resonance. An utterly heartbreaking rumination on family, tradition, and the passage of time, 'The Ballad of Narayama' effectively blends cinema and kabuki theater to mostly stirring results. While the chanting narration can seem superfluous at times, I eventually warmed up to this approach, and despite a few lulls here and there, the film ultimately proves to be engaging and moving. Steeped in a sorrowful malaise, the story's melancholy content is distressing, but the director's meditative allegory draws some poignant insights about aging and familial bonds. Elegiac in tone and distinctively staged, the movie offers a unique experience, that while not entirely successful, is sure to leave a lasting impression. 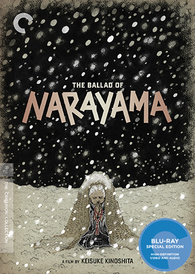 Criterion presents 'The Ballad of Narayama' in their standard clear case with spine number 645. The BD-50 Region A disc comes packaged with a booklet featuring an essay by film critic Philip Kemp. The film is provided with a 1080p/AVC MPEG-4 transfer in the 2.35:1 aspect ratio. Recently restored, this is a very solid image that is held back slightly but a few minor issues. The print has been cleaned up nicely and retains a light layer of natural grain. With that said, there are some faint signs of degradation in darker scenes. Of more concern, however, is a strange anomaly that occurs around the 36:02 mark where the picture briefly moves in an odd stuttering slow motion effect. This lasts until the 36:24 mark and then does not occur again. Though clearly not intentional, it doesn't prove to be very distracting. The majority of the film is framed in wide shots, and clarity is a little on the soft side. Thankfully, fine details are still readily apparent in all of the elaborate sets, showing off the intricate production work. The colors are often tinged in a yellow or orange glazed hue, and the film's striking lighting design is quite impressive, bathing important scenes in bold reds and ethereal greens. Contrast is decent, though black levels are a little inconsistent and occasionally elevated. 'The Ballad of Narayama' features a very unique look, and the film's impressive set designs and theatrical lighting compositions are all faithfully rendered. There is a fleeting motion anomaly, but for the most part, this is a respectful transfer. The audio is presented in a Japanese LPCM mono track with optional English subtitles. The single channel mix is modest, but it suits the movie well and is free from any major age-related concerns. Dialogue is relatively full and always easy to make out. The kabuki influenced storytelling relies heavily on the use of music, and while the style might not be everyone's cup of tea, the wailing voices and steady beats all come through cleanly with solid fidelity. Effects work isn't particularly notable, but the nature ambiance is handled well with decent range. Thankfully, I detected no crackles or pops, but minor background hissing is audible in some scenes. The mix is basic but sounds pretty good for its age. The music is an integral part of the narrative, and thankfully it is preserved nicely. Trailer (HD, 3 min) - The film's trailer is included in 1080p. Teaser (HD, 2 min) - The movie's teaser is included in 1080p. 'The Ballad of Narayama' is a tragic cinematic parable that effectively fuses filmmaking and kabuki theater into a unique storytelling style. Not all of this blending completely gels, but the powerful performances and impressive production design easily make up for any small shortcomings. While there is a notable motion anomaly, the video transfer is solid and the audio mix is faithful to its modest source. Unfortunately, this is a pretty barebones release from Criterion, with no real supplements outside of the included booklet and some trailers. The film isn't exactly a masterpiece, but it offers an emotionally stirring and visually distinct experience. Worth a look.